When my son was born, over nine years ago, I went from being a full time teacher and children's ministry director in my local church to a stay at home mom. Post pregnancy was difficult from an unscheduled c-section and with lactation issues between myself and my baby, I was wondering why women were so ready to give advice on just about everything before the birth besides post pregnancy! I had really no idea how hard it was going to be on my physical body as well as my mental state. To help my milk come in, the lactation nurse gave me herbs that I really didn't understand much of in my loss of sleep state. She overdosed me on these to the place where I couldn't get out of bed to either help myself or my son. My husband had to nurse us back to health and my family had to come and help me eat. I lost about 20 lbs in this two week period of illness. In this state of fog, I could hear the lies I was being told in my head that I was a part of a great mission before motherhood. I taught 50 children during the week in a private Christian school, was a Sunday School teacher of over 50 children in church, was able to sing with the church every week on the worship team, and directed the programs of our local church while led the team of children's ministry teachers. Instead of doing great things, I was feeling like I was basically a cow - pumping, feeding, pumping feeding, and then on repeat. I think that the enemy loves to use the lack of sleep and out of wack hormones against women. The lies that we will believe due to less than 5 hours of sleep is surprising! Not enough coffee can help us! It took me a long time to get out of this fog. 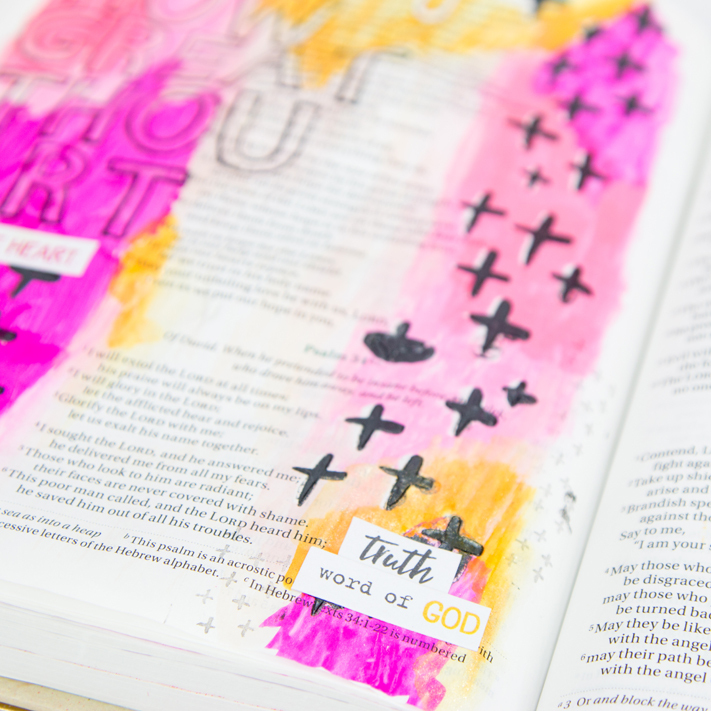 I created, what Beth Moore calls, a Truth Journal. All of the verses I read that spoke to me about God's plan for me, my heart's desire, and how he loves me I wrote in this little pocket sized notebook. I carried this pocket notebook in my back pocket and when the fear or doubt started again, I would just pull it out and read the verses again. I know that it was through this Truth Journal I was able to find my purpose as a mom. God gave me back the desire to paint again and started me on a path to working in the craft industry. It has been a beautiful new journey. I am discovering who this new person is and who He wants me to become as a mother. So, this week, I have been reminded of these times. My three year old daughter hasn't been sleeping well. She has been waking up for me between 5 and 7 times in the night. There has been lots of crying and not just from her! Ha! In everything, I need to give Him all the praise because He is great and good. He is love. He loved me enough to deliver me through the first fog and he will continue to do so this time. I know it will be a lot faster because my Truth Journal is with me right now, with this verse front and center. 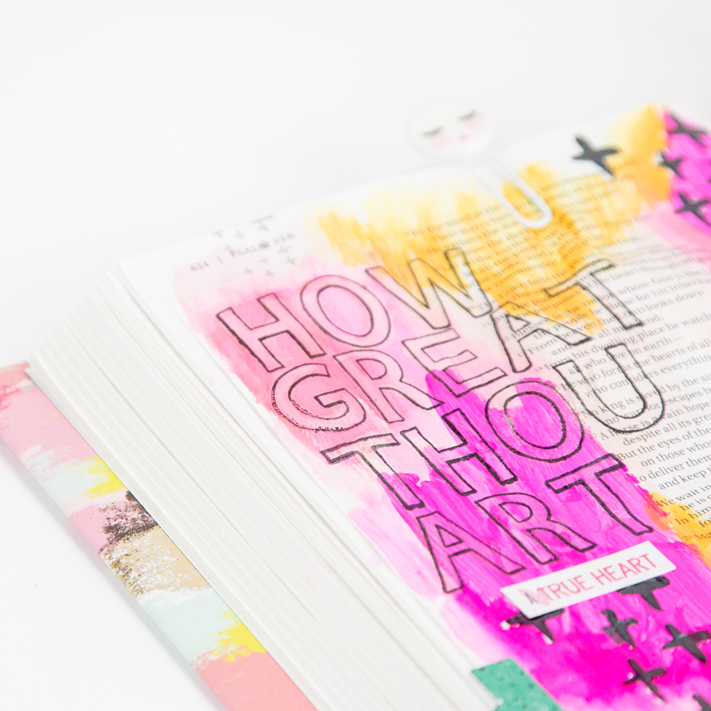 To create this page in my Bible Art Journal, laid a layer of pink paint in three places on the page. Then, I had fun with a new medium in my Bible. 1. Paint pink strips on page. Let dry. 2. 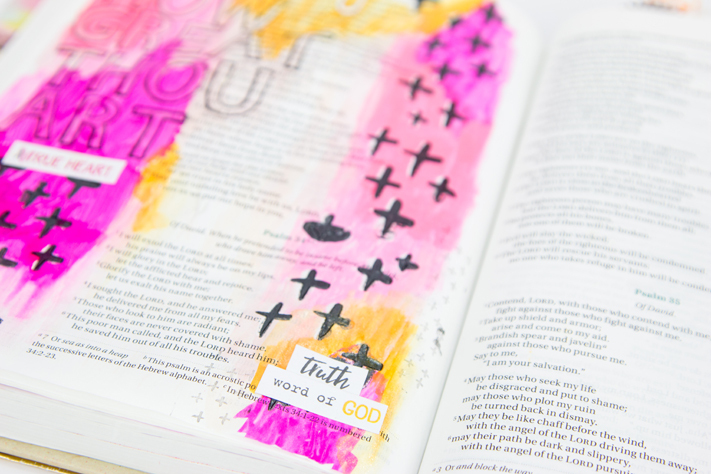 Use texture paste with stencil on Bible Mat. Let air dry completely. 3. 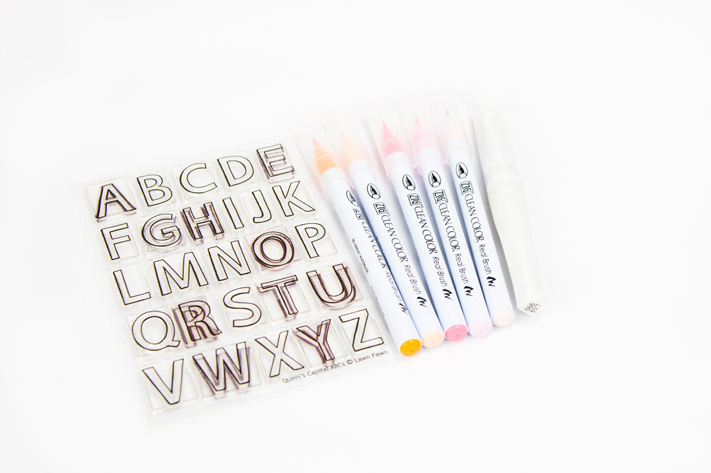 Stamp letters on the page with Staz-On ink. 4. Use pens to color page randomly. 5. 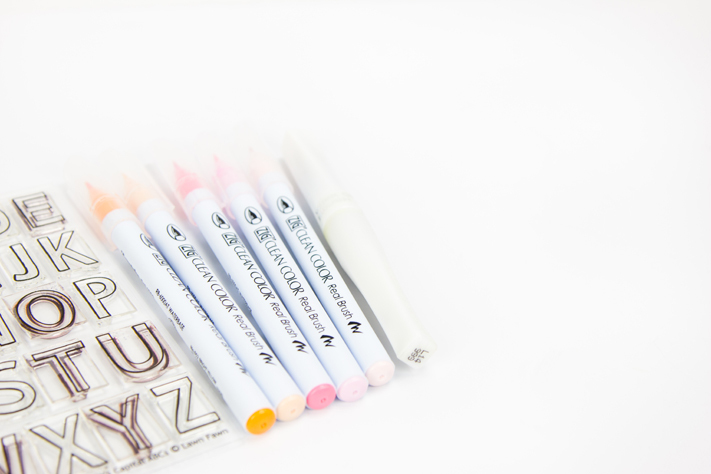 Use the Wink of Stella Brush pen to blend colors together. The sparkle from this pen is so fun. The photograph doesn't do it justice! Even though the shine is all over, you can see it above in the ts and h.
6. 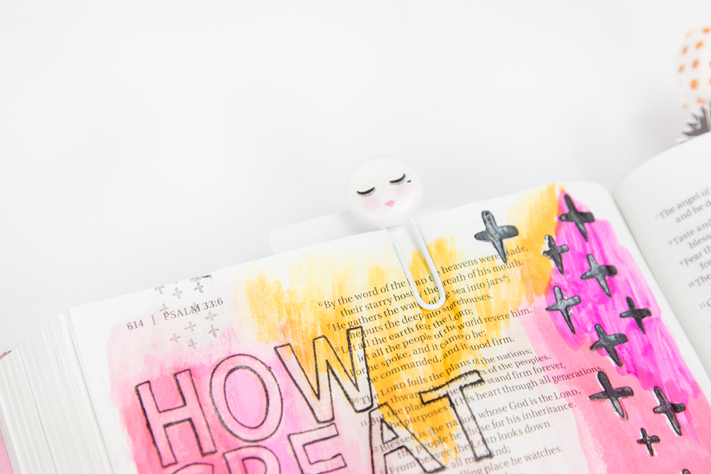 Add stickers, extra stamping, and a paperclip to find your spot easily. Believe truth over lies. You DO have a purpose and what you might be going through right now is only for a season.